"This land is ours. We lived here long before the apes." A species of highly intelligent creatures that evolved during the age of dinosaurs, the Silurians were distantly related to their aquatic relatives, the Sea Devils. Both species went into hibernation upon thinking that the moon was about to collide with the earth. It didn't; the disaster never happened, but their disappearance cleared the way for humans to take over as the dominant sentient lifeform. Eons later, they awake, and fight the upstarts (read: us) for control of Earth. It never ends well. 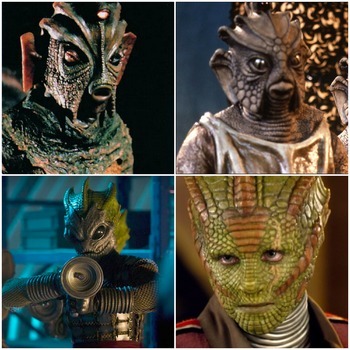 The 21st century series gave the Silurians a very heavy redesign, with only two eyes, a more generally humanoid appearance (their battle armour has a mask that looks closer to the original face), and a multipurpose, venomous tongue. This is explained that the Silurians (unlike other species) showed an important intraspecific variation (vast differentiation between breeds), such as the number of eyes, the formation of their pupils or the colour of their skin with a wide range of subspecies (one of which is Sea Devils). The Ark: One of their many survival plans built was a space-faring version, containing a few thousand Silurians and a zoo's worth of dinosaurs. Unfortunately, a space pirate boarded the vessel and flushed them all out the airlock. Attack Animal: The Silurians of Wenley Moor used a dinosaur like creature. In "Warriors of the Deep", they used a Myrka (a genetically modified animal made by the Silurians from a pantomime horse an unknown deep-sea creature). Beneath the Earth: They have lain dormant there for millions of years, and possess very advanced technology. Blue and Orange Morality: Some express the desire to reclaim Earth and exterminate humanity with the justification that they came first and that humans are encroaching on "their" world. The Doctor politely points out that it doesn't work that way. The Cameo: In "The Pandorica Opens" they are members of the Alliance, and watch as the Doctor is dragged to the Pandorica. Extra Eyes: The Silurians have a third eye, which glows when they exercise psychic powers (in their first appearance) or when they talk (in their second). It has, however, utterly vanished from the newest incarnation of the species appearing in "The Hungry Earth"/"Cold Blood" and "A Good Man Goes to War", who are handwaved as being a different branch of the same species, somewhat analogous to the difference between Humans and Neanderthals. Everything's Better with Samurai: An elite task force of Sea Devils called Elite Group One was dressed in secure, samurai-style armour. Katanas Are Just Better: Perhaps as a subtle nod to the above, Madame Vastra wields one of these as her Weapon of Choice. Exposed Extraterrestrials: Silurians in "Doctor Who and the Silurians" and "Warriors of the Deep". Averted in "The Sea Devils" due to a concern about "naked Sea Devils running around on telly at teatime". Fantastic Racism: The average Silurian doesn't really have a high opinion of us "apes", and don't want to share the planet with us. For some of them, this applies to mammals in general. Even Madame Vastra has her moments. Insistent Terminology: They refer to Gene Lines rather than families, and some other touches. Kill 'em All: Has a distressing tendency to happen to them whenever they appear, despite the Doctor's best efforts. It's their fault at least some of the time, such as when a militaristic faction deliberately sabotages peace talks with humanity. Last of Their Kind: Every named Silurian in the episodes they show up in will make this claim. It was more understandable in the original series (and subsequent expanded universe tales), where it was literally a few dozen at best who survived. When a captive Silurian tries to claim this on the Doctor in "The Hungry Earth", he shuts her down pretty quickly. Likely, since the species seems to have had a variety of branches and different survival plans, they're simply wrong. Living Dinosaurs: They are sentient dinosaurs who evolved on Earth geological periods before humans did. Lizard Folk: They are an ancient race of reptilian humanoids that predate humans. More Deadly Than the Male: Since their reappearance in 2010, the female Silurians have been portrayed as more aggressive than the males. Much like real-life lizards, then. Non-Mammal Mammaries: Well... the modern ones have them, anyhow. Not Evil, Just Misunderstood: Their portrayal in the revival series is this, as their "kidnapping" attempts were merely examinations in trying to find out more about the humans. Overly Long Tongue: Which are capable of stunning an opponent upon contact. Sea Devils may also fit this trope. The more recent versions of the Silurians avoid this trope. Yes, they have a military, but it's not the driving aspect of their culture, and they have a phenomenal grasp of science. Psychic Powers: Silurians who have the third eyes have shown the capability of harming organic beings, killing them or leaving them unconscious. Alternatively, they could revive a human (or Time Lord) that they had rendered unconscious with the third eye. Energies emanating from it allowed them to burn through walls and create tunnels. These Silurians also employed their third eye in less destructive tasks, such as activating their technology, opening passageways or creating force-fields to trap prisoners. Rage Helm: The warrior caste Silurian faceplates are organic in appearance, and could easily be mistaken as a real (albeit scarier) face. Red Scare: "Warriors of the Deep" is largely ham-fisted, with Cold War metaphors up the wazoo. The Silurians were also a metaphor for the Soviets at the time, according to Word of God. The Sea Devils may have been this as well, but it doesn't seem as likely. The Reptilians: Although they are actually native inhabitants of the Earth. Talking Lightbulb: Like the Daleks, the original designs' third eye is a flashing light bulb to indicate which Silurian is talking. Ultraterrestrials: The first native sentient species on Earth, millions of years before humanity. Underground City: Have made a very impressive one where they remain in hibernation. Underwater Base: Sea Devils had thousands of underwater colonies dotted across the globe, each filled with millions of their kind. These bases were carved out of rocks and were generally covered in algae and seaweed. The colonies could be awoken en masse through the use of a sonic signal.